The 31st Medina Candlelight Walk, sponsored by Root Candles, Bill Doraty Kia, The City of Medina, Building Blocks Adoption Service, T&M Associates, and Main Street Medina, will be held November 20-22, 2015. The volunteer committee is hard at work making plans to expand the offerings of the event, including more entertainment, more decorations, and lots of free, family fun. Throughout the weekend, the shops and restaurants of the 9 block Medina historic district will be open later into the evening to welcome up to 50,000 local and visiting guests from around the region. The perennial favorite, Medina County Farmers Market Winter Market, will be held at Root Candles on Saturday and Sunday. 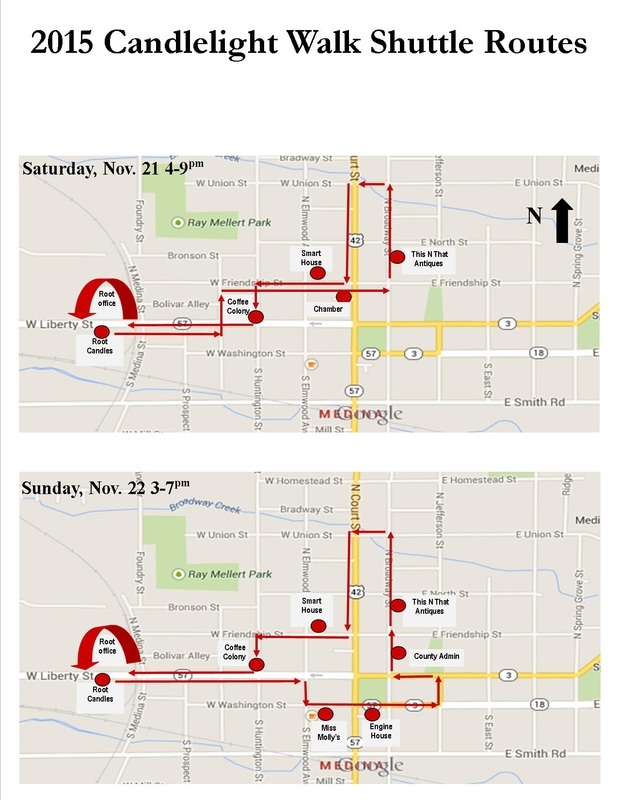 Shuttle buses will be available on Saturday and Sunday to help transport guests to various destinations around the district. Candlelight Walk involves more than 150 volunteers, 750+ volunteer hours, 1,750 luminaries, 5,000 votive candles, 15,000 Christmas lights, a truck load of sand, a 13’ Christmas tree, a 60 unit parade, 62 holiday flags, lots of coordination, and has a budget of just under $25,000. 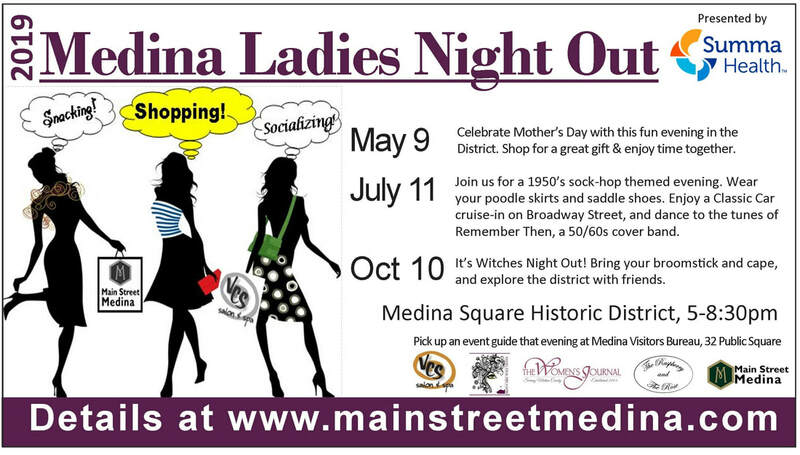 The majority of the event is paid for through generous financial support from major sponsors, as well as numerous sponsorships from the businesses of the historic district and members of Main Street Medina. Community residents, businesses, and friends of Main Street Medina can support the funding of the celebration by donating at www.gofundme.com/cvercs. The three day holiday kick-off begins on Friday, November 20th, with a vocal performance by Prince of Peace Lutheran Church Choir, followed by the much anticipated lighting of the district with special guests Mayor Hanwell, Medina City Council, and the Root family. This year, the Main Street Medina Design Committee has included Bicentennial Commons Park to the decorating with more lights, greenery and holiday finery. Saturday, November 21st, will be a day of community celebration, beginning with the amazing Holiday Parade of Lights, presented by Catholic Charities. At 5:30pm, over 50 parade floats, cars, trucks, and even people are covered in lights, and make the mile-long trek down the parade route from Medina High School to Public Square. Mayor Hanwell and Santa Claus will round out the parade as Santa takes up residency on Broadway Street in his little house. Santa will be available for photographs on Saturday evening and throughout Sunday. Bill Doraty Kia presents the Light up the Night Fireworks at 7pm. The pyrotechnic spectacular will be launched at 7pm from the top deck of the County parking deck behind the County courthouse. The show is best viewed from Public Square or surrounding blocks. On Sunday, HMC Hospice of Medina County will present a church and community chorus concert on the Broadway Street stage, followed by the moving and inspirational candlelight ceremony.